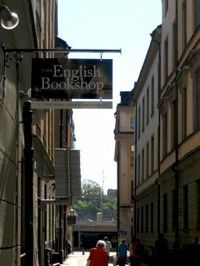 Located in the Stockholm Old Town, at Lilla Nygtan 11, the bookshop carry pretty much the same range in Stockholm as in the Uppsala shop, except for SF & Fantasy. 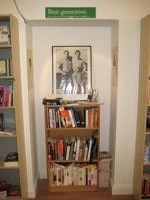 You will find the same welcoming atmosphere here, as the Uppsala English Bookshop is famous for: an interior jampacked with exciting books, relaxing chairs and a dedicated staff. We already love this new place in the Old Town of Stockholm and hope you will too! At Thursday May 8 2008 Carolyn Cassady cut the ribbon to our new store at the corner of Kåkbrinken and Lilla Nygatan. Afterwards this graceful lady had a hectic time signing copies of autobiography Off the Road –about her years with N. Cassady, J. Kerouac and A.Ginsberg.